The religious face of America is largely a Christian one, with roughly seven-in-ten Americans belonging to that faith. But some of the nation’s biggest metropolitan areas have a very different look. 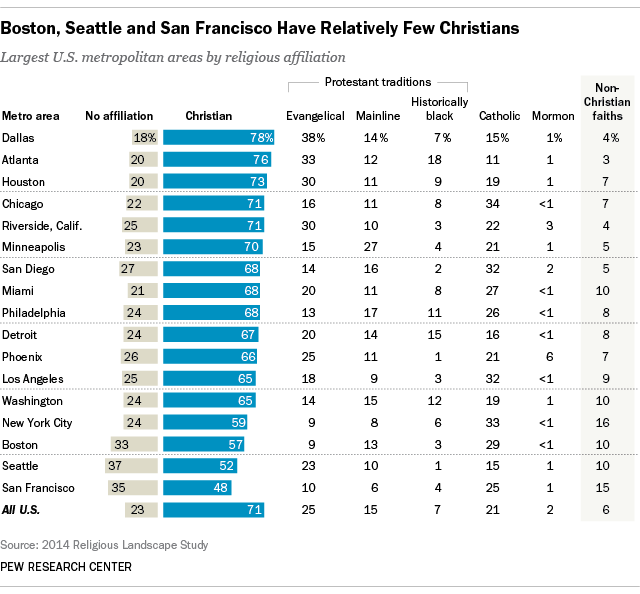 Only about half of the residents in the Seattle (52%) and San Francisco (48%) metropolitan areas identify as Christians, as well as roughly six-in-ten or fewer of those living in Boston (57%) and New York (59%). The Pew Research Center’s 2014 Religious Landscape Study was designed to look at the religious affiliations of Americans overall as well as those in all 50 states and the 17 largest metropolitan areas in the country. While Christians make up between 65% and 75% of adults in most of those metro areas – and people with no religious affiliation generally make up roughly 20-25% of the population – some cities stand out for a variety of reasons. One-in-ten Seattleites are self-identified atheists (10%), while 6% are agnostics. Meanwhile, 10% of San Franciscans call themselves agnostics, compared with 5% who are atheists. Nearly a quarter of New Yorkers are religiously unaffiliated (24%), but the city also is home to relatively high numbers of members of non-Christian faiths. Nearly one-in-ten New Yorkers (8%) are Jewish, 3% are Muslim and another 3% are Hindu. Among the 17 largest metropolitan areas, New York’s Jewish share is matched only by Miami (9%). Roughly three-quarters of residents of three Southern cities – Dallas (78%), Atlanta (76%) and Houston (73%) – are Christians. In each case, at least three-in-ten are evangelical Protestants (including 38% in Dallas). And Atlanta, the birthplace of Martin Luther King Jr. is home to an especially large share of members of the historically black Protestant tradition (18%). Three of the most heavily Catholic cities also are the nation’s three largest cities. About a third of residents of New York (33%), Los Angeles (32%) and Chicago (34%) are Catholic. In each of these cities, fewer than one-in-five residents are evangelical Protestants (including just 9% in New York) – compared with a quarter of U.S. adults overall who are evangelicals. Among the nation’s biggest metro areas, Phoenix has one of the highest concentrations of Mormons (6%). But this analysis does not include smaller cities, such as Salt Lake City, that may have a larger proportion of Mormons. Note: Further details on the religious makeup of cities (as well as states) are available at our interactive website on the 2014 Religious Landscape Study.